In my dispatches last Wednesday and Sunday, I revealed that black-shirted and black-hooded students at Al-Quds University in east Jerusalem had held a Fascist-style rally on campus, apparently with the consent of the university authorities. Since there has been considerable interest in this topic, below are a few follow-up notes. The Al-Quds University spokesperson has now confirmed that the statement they issued (that I included in my last dispatch) was signed by Dr. Imad Abu Kishek, Executive Vice President of Al-Quds University. However, the university spokesperson has also confirmed that the university’s statement is only in English and will not be released in Arabic – which is strange if they truly want to send a message to their students that this kind of Fascist-style display is “totally unacceptable,” as the vice-president of the university wrote in his English-language statement. At the weekly Israeli cabinet meeting at the start of this week, Prime Minister Benjamin Netanyahu referred to the Al-Quds photos when discussing the growing Palestinian incitement against Jews. “Noting that it was the 75th anniversary of Kristallnacht, in which the Nazis realized they could attack, rob and kill Jews without any meaningful reaction from the West, thus paving the way for the Holocaust, Prime Minister Benjamin Netanyahu said: ‘It is very disturbing that precisely 75 years later we are witness to the phenomenon of swastikas and Nazi-style salutes,’ Netanyahu said, referring to an incident last month when a Nazi flag was hoisted near Beit Umar in the West Bank, and to a military-style parade at Al-Quds University last week organized by the Islamic Jihad faction where students gave Hitler-style salutes. Netanyahu then shared the al-Quds University photos from the “Tom Gross Media” website on his official twitter account. The Al-Quds rally and photos were mentioned during a discussion show both yesterday and today on Al Jazeera TV. For example, they are mentioned at 11 minutes 10 seconds, and then again at the end at 24 minutes 20 seconds in this clip . It continues to be a matter of disappointment that while many right-leaning media have covered this (as well as foreign-language online media in Spanish, French, German, Polish (if you scroll down) and other languages) not a single centrist or left-wing journalist based in Jerusalem (and many subscribe to this email list) has covered this topic. It is surely not for lack of space since they regularly report on whatever negative stories they can find about Israelis. Instead it has been left to ordinary readers to put a link to the Al-Quds photos in the comment sections under various other articles on the Middle East on the websites of liberal and centrist media. Continuing to ignore the widespread and growing Palestinian incitement to kill Jews, as the more liberal international media do, does not bode well for peace. Some might say that keeping silent in the face of such extremism makes as loud a statement as those who actually staged the event in the first place. Islamic Jihad were open about what they were doing in a public rally. But what are we to think of those American universities, media and diplomats who let down their liberal credentials by turning a blind eye to these events? Shrugging it off as though this kind of thing doesn’t happen should not be an option for them. Palestinian students at Al-Quds University tell me that the rally was organized and attended by Al-Quds university students belonging to the Islamic Jihad faction of students at Al-Quds University, and held on campus with the full knowledge of the Al-Quds University administration, and the Brandeis statement is incorrect. In addition, the photos show a very clearly organized event, with a huge printed backdrop with pictures of suicide bombers, a “red carpet” style Israeli flag walkway for all to trample on, seats carefully laid out for the audience, and a sun cover mounted over the seats to shield the audience from the sun. Regardless of the reassurances given to the Brandeis president by Al-Quds University, just from looking at the photos, one can see that it is logistically highly unlikely that the event could have been organized without their authorization. Given this, one wonders if they will be satisfied by the promised Al-Quds investigation if it exonerates the university. The statement by the Brandeis president also ignores the previous two similar demonstrations held on campus so far this academic year by the Hamas student faction at Al-Quds. Will the Brandeis president call for the dismantling of the Islamic Jihad faction of students at Al-Quds University? Islamic Jihad, by their own admission, have killed civilians including children and babies and are listed by both the U.S. and EU as a terrorist group. I am told further, having spoken to students at the university, that there is no such thing as an unauthorized demonstration at Al-Quds University, or indeed almost anywhere under Palestinian Authority control. The university has security guards at the gates that monitor everyone that comes into the university. You have to show student ID to get on to the campus. Last Tuesday's student-organized Islamic Jihad rally lasted between two and three hours and up to 1000 students attended or watched the rally for at least part of this time, according to students who were there. And in the Al-Quds demonstration by the Hamas student faction a few weeks ago, vile literature was handed out, including leaflets comparing the Israeli campaign in Gaza to the Hiroshima nuclear bomb, and photos of suicide bombers were displayed. Another organization designated by the West as a terrorist group, the PFLP, which also has a student faction at the university, also held a student rally a few weeks ago on the campus of Al-Quds. The Islamic Jihad organization in the Palestinian territories has been labeled a terrorist organization by both the United States and European Union. It has carried out many terrorist attacks killing and maiming hundreds of civilians. Brandeis University – America’s best known liberal Jewish university – is facing criticism after refusing to distance itself from the rally held on the campus of its Palestinian partner university. The Brandeis-Al-Quds partnership is funded in part by the Ford Foundation, which has come under intense criticism in the past for funding organizations that have been accused of being anti-Israel or even anti-Semitic. Brandeis spokesman Bill Schaller, despite being repeatedly asked by American journalists for a comment about the pictures and press reports on the Al-Quds rally, has (as of yesterday) still refused to give one. While other students at Brandeis condemned the rally, the branch of the J Street organization at Brandeis has also refused to comment on the demonstration. I am told that the Brandeis student newspaper will soon be running a story on Brandeis’s failure to condemn the rally. I attach an article on Brandeis below, from The Washington Free Beacon, and another article after that on Islamic Jihad. Brandeis University is facing criticism from students and faculty members after refusing to distance itself from an event recently held on the campus of its Palestinian partner school that critics decried as a “Nazi-style” rally. Brandeis, the nation’s most well known Jewish university, partners with the Palestinian Al Quds University, where students held a military rally on Tuesday of last week. Groups of Al Quds students dressed in black military gear and armed with fake automatic weapons marched on the school’s campus while waving flags and raising the traditional Nazi salute, according to pictures first posted by Middle East analyst Tom Gross. The rally was organized by the Islamic Jihad’s student faction, which is known to be active on the Al Quds campus. Brandeis, which began partnering with Al Quds in 2003, declined multiple requests for comment on the rally. The rally prompted some students and faculty members to express outrage. “It bothers me very much that the school I am attending has a partnership with a school that inherently promotes death to Jews,” said student Eve Herman, who serves as the president of the Brandeis Zionist Alliance. One Brandeis faculty member who agreed to speak anonymously said he found it “appalling” that that such inflammatory activities take place at Al Quds. Brandeis officials should be communicating their outrage at such a demonstration, the faculty member said. However, Brandeis spokesman Bill Schaller repeatedly declined comment after the Free Beacon presented him with pictures and articles about the rally. “We have no comment,” Schaller told the Free Beacon on multiple occasions. The Brandeis-Al Quds partnership is funded in part by the Ford Foundation, which has come under fire in the past for funding organizations that some accuse of being anti-Israel. Brandeis and Al Quds exchange students, administrators, and faculty members under the program. Islamic Jihad’s official website also reported on the rally and included multiple pictures of armed men trampling over a banner that had been painted with Jewish stars. Several actors portraying dead Israeli soldiers also could be seen sprawled across the banner. 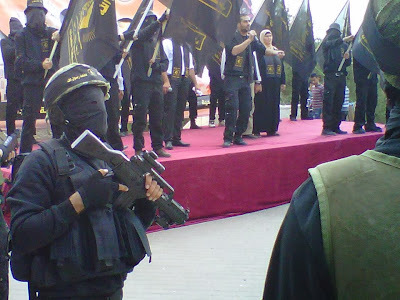 Al Quds students reportedly called for “jihad” during the event, as well as for the death of Israeli soldiers and their families, according to Islamic Jihad. Imad Abu Kishek, the executive vice president of Al Quds University, also denounced the rally in a statement. The demonstration “horrified the whole student body who is not used to such acts on campus,” Kishek said. Al Quds promotes “openness and toleration” despite daily provocations by “Israeli soldiers,” Kishek said. “This has been the case in spite of all kinds of difficulties that Al Quds University students, in specific, are facing on daily basis from Israeli soldiers, whom provokingly keep attacking them along side university staff with hundreds of tear gas bombs,” he said. Kishek’s statement was provided in English only to members of the press who inquired about the demonstration, according to Middle East expert Gross. “I have been told by students that the university has not yet translated it into Arabic nor posted it on any official university website,” Gross told the Free Beacon. Several members of J Street U Brandeis, a campus group affiliated with the liberal Middle East lobbying group J Street, did not respond to a Free Beacon request for comment on the demonstration. This is not the first time that Al Quds has hosted militant rallies, Gross said. “I am informed by students at Al Quds University that the Hamas student faction there had already conducted at least two similar military-style demonstrations praising suicide bombers at the university so far this academic year, and no discipline was taken against them afterwards because no photos of them were exposed to a Western audience, like last Tuesday’s demonstration was,” Gross said.